The next time you run a typical keyword/metadata search on your SourceAudio site you'll notice some new tabs in the black bar above the tracks on your search results page. 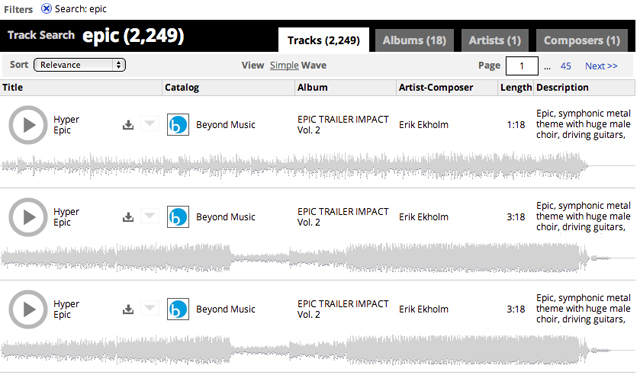 In addition to returning relevant track results, we're now returning Albums, Artists, Composers, Labels and Catalog results for you. Run a keyword/metadata search just like you've always done and you'll be taken to the track results page by default - this hasn't changed. If your search term is related to the name/title, description, or album code (for albums only) of Albums, Artists, Composers, Labels and Catalogs on your site, you'll see new tabs appear for each those content items. If one or more of these new tabs do not appear on a specific search it means that no related items were found for those corresponding content types. Now you've got the most powerful music search tools available anywhere at your fingertips. From Sonic Search, to Find-As-You-Type, to this new Content Type extension of the search results page, we're confident that you and your clients have all the tools you need to quickly discover what you're looking for!